I don’t normally do award things because, let’s face it: I’m an ungrateful jerk. Ok, maybe not. But I do kind of feel like one when I respectfully decline. It’s not that I don’t appreciate being recognized by fellow bloggers; it means a lot actually. It’s just that the rules that usually accompany these awards, including the mandatory passing along of the award to multiple bloggers, has a chain-letter feel to it that doesn’t sit right with me. However, I do make exceptions when 1) the blogger who nominates me is relatively new, therefore giving me a chance to send traffic their way, or 2) the award is a little weird. 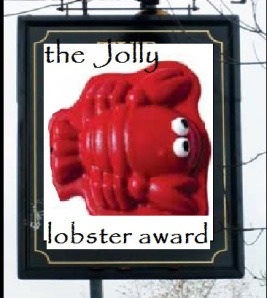 In the case of The Jolly Lobster Award bestowed on me by CeeLee at Swim In The Adult Pool, it’s both. Shortly after my WordPress “new follower” cross lit up last week, I found my way to CeeLee. Ok, actually I attempted a cartwheel that ended in something resembling a twerk first. The point is, once I got to her site I was immediately impressed by her writing as well as her tenacity and spirit. Effectively dealing with adult ADHD means CeeLee has to approach her sometimes relentless creative spark in ways many of us would never think of attempting. Sort of like my “twerk-wheel” but with better results. “Less than a month ago I was ready to throw in the towel on blogging. Why? My inspiration is sporadic, doesn’t bother sending me a courtesy heads up email before it strikes, and it most definitely doesn’t care to keep daytime hours. Case in point. See my picture on the right? That’s me after spending the night in darkened living room resentfully pecking out a *3am star, instead of sleeping and dreaming decadent dreams of docs that require no formatting. It began playing havoc with my ADHD symptoms, my sleep, my everything. 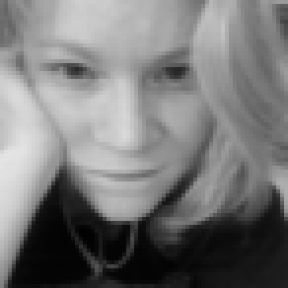 As I read her post, it made me think about the things I take for granted as a writer: Being able to call upon my creativity (and have it occasionally answer) as opposed to being at the mercy of its whims; Needing little more than strong coffee to remain focused on an idea, at least until it hits my bladder; and having the ability to shut my brain off at bedtime (although my editor would argue it shuts off long before that). 1) Display the award badge. Lobster Fact: In 1993, I dropped a live Maine lobster on the foot of Reba McEntire who then ordered broiled salmon instead. How did this happen? I was a chef for 10 years before becoming a journalist. In 1993, I was at a restaurant in Memphis, Tenn., when Reba McEntire came in and ordered lobster. She went to the tank to choose her lobster and I volunteered to rake it out. As it came to the top, she squeezed my shoulder and I jumped, dropping the 1.5-pound crustacean on one of her open-toed heels. My kitchen nickname became “Fancy” forever after. I didn’t do well in middle school science, but I do know that almost everything has a hole. 2. What is your favorite sea creature? I have to say yes. And that they have the ability to walk on land. That’s the only explanation I have for the beauty and enchantment of my wife. Plus she looks great without her top on. I think it’s a lot like Washington D.C.; even without sponges it still gets pretty deep there. It’s hard to say. But I know a lot of boat owners would be really mad. All of these blogs, in addition to being relatively new to the blog-o-sphere, are great examples of folks who Enter Fully Into the Fun of Blogging. Please visit them. You’ll be glad you did or your money back. 1) What do mermaids eat tarter sauce with? 2) Would you ever consider using a starfish in self-defense? 3) In “Jaws,” which character do you identify with the most? 6) “Gilligan’s Island” or “Lost”? 7) What do dolphins know that we don’t? I’d like to thank CeeLee once again for thinking of me, and including me on her list of Jolly Lobster nominees. And Reba: I’m sorry again about that lobster.